Armchair Fiction presents illustrated, extra large paperback editions of classic science fiction double novels. The first novel, “The Ant With the Human Soul,” is a brilliant imaginative yarn by master writer Bob Olsen. Although the majority of science fiction readers of the Twenty-first Century probably don’t know the name Bob Olsen very well—if at all—back when “modern” science fiction was still quite young (circa 1929) every first-generation reader of Hugo Gernsback’s Amazing Stories most certainly did. Olsen had a constant presence in that granddaddy of all science fiction magazines, and whenever a new Olsen story appeared—especially one in the “Four-Dimensional” series—his many fans knew they’d be getting a unique blend of sound science (of the times) and refreshingly light-hearted narrative. A mixture as rare then as it is now, but still delightfully strong in the following sci-fi opus, “The Ant with the Human Soul,” which has one of the oddest protagonists perhaps in the history of science fiction literature—an ant who once tried to drown himself in San Diego Bay! The second novel, is by another great sci-fi veteran, Keith Laumer. 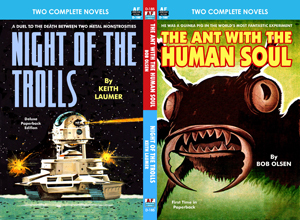 “The Night of the Trolls,” was the first of what would become a very popular series for Keith Laumer—his “Bolo” stories. A Bolo was a rolling automated combat unit. It was bigger than a tank, far more dangerous, and could kill anything that moved (and usually did). They were also capable of carrying out very complex and intricate programs. In this first Bolo story, an astronaut named Jackson awakens from a suspended animation experiment and discovers something is terribly wrong. It’s eighty years later and his base is deserted. So is the nearby town. What he does find, though, are roving bands of sub-humans and a madman with a Bolo at his disposal. It soon becomes obvious to Jackson that a Bolo Mark II and a Bolo Mark III hold the keys to the balance of power in this mad, post-apocalyptic world.